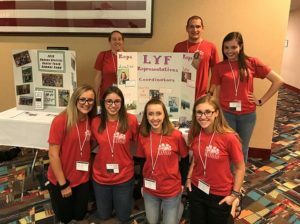 The Kansas District Lutheran Youth Representatives (LYR) program gives young people an opportunity to grow in faith and strengthen their leadership skills as they share the love of Christ with other youth. The representatives attend meetings of the District Youth Ministry Team, help at events such as the Kansas District Youth Gathering, and visit churches, where they worship with the congregation and present Bible studies. If you’d like to arrange an LYR visit at your congregation, please contact one of our LYF coordinators, DCE Charity Smith (dce@stlukesmanhattan.org) or Jesse Smith (smithjesse@icloud.com). If you’re interested in joining the team, complete the application below by August 15. Favorite Bible verse: Jeremiah 29:11. I tend to stress out about many things in my life and this verse reminds me that God is in control. He knows what he’s doing, and I just need to trust in him. Why LYR? I wanted to be a part of LYR because I wanted to be more involved in my faith life. I go to church on Sundays and Wednesdays, but I knew being part of LYR would make me take a closer look at my walk with Christ. I also wanted to be a positive representative for Lutheran youth. Through being a Lutheran Youth Representative, I’ve gained a different perspective on the workings of the Kansas District. For example, the other representatives and I hosted a sectional at the District Youth Gathering. It was nerve-wracking and pushed me out of my comfort zone, but I really enjoyed the experience. Favorite Bible verses: Joshua 1:9 and Psalms 91:2. These verses are reminders to me that God is my strength, and that his love for me will never falter. Why LYR? I love being a part of LYR because it gives me so many opportunities to share God’s love with people, whether it be at a church visit, my church, or at school/work. I love that I’m able to build relationships with kids my age in other towns through Christ. This program has also provided me with the opportunity to grow my leadership skills and break out of my shell. Why LYR? Being a part of LYR has given me the opportunity to strengthen my leadership skills and my faith as a whole. Fun fact: I play three different instruments. My main instrument is the clarinet, which I use in my high school band. I taught myself the ukulele and tenor saxophone in my free time. Favorite Bible verse: Exodus 14:14. This verse reminds me when I’m going through things that I’m not alone. When I can’t God can. Why LYR? I love meeting new people and growing in my faith. My sister encouraged me to apply, and I’m glad I did. There are many benefits from the LYR program. I’ll grow in faith, become a better public speaker, and make great connections around the state. Favorite Bible verse: Micah 6:8 – “But he’s already made it plain how to live, what to do, what God is looking for in men and women. It’s quite simple: Do what is fair and just to your neighbor, be compassionate and loyal in your love, and don’t take yourself too seriously — take God seriously” (MSG). Why LYR? I’m excited to be a new member of LYR, because my faith has had a huge impact on my life, and I want to help share that faith with the youth of the Church. I would also like to help the youth understand the important role they play in the Church. Why LYR? I enjoy being a Lutheran Youth Representative because I have grown as a Christian and established a stronger faith in the two years I have been a part of this team. I get to practice sharing the Word and what I believe with my peers around the state of Kansas. Favorite Bible verse: Colossians 3:23: “Whatever you do, work at it with all of your heart, as working for the Lord, and not for human masters,” because it reminds me to do my best and to keep God at the center of it all. Why LYR? LYR has helped me branch out, and my communication and organizational skills have greatly improved. I’ve also helped out more at church and in my community. I think it’s easy for us all to turn down an opportunity to help out, thinking of all of the reasons why we shouldn’t do it, but I learned that it’s refreshing to step out and be the one to say, “I can help,” which also inspires others to do the same. LYR has allowed me to grow in my faith, step out of my box, and try new things. Jesse Smith, originally from Superior, Nebraska, works as a quality control expert at the ATEAM on Ft. Riley. His favorite Bible verse is Jeremiah 29:11, which sums up his goal for his family as the leader of his home. Charity Smith has worked as a director of Christian education (DCE) at St. Luke’s since November 2012. She graduated from Concordia University Chicago and is originally from Richmond, Virginia. Charity’s favorite Bible verse is Titus 2:7-8, which sums up her desire for how she wishes to conduct herself in ministry. The couple is expecting their first child in May 2019. Jesse and Charity decided to volunteer with the LYR program because they value youth ministry. They’re excited that they get to work with some phenomenal youth from across the Kansas District and help develop their leadership skills. We’ve been very grateful for this chance for our daughter to use her leadership skills for the benefit of students in our synod. She uses them at school and work, but through LYR she can make an eternal difference.